We went on an adventure today. We live in Southern Utah, so there is no shortage of fun hikes and outdoor activities to do (we live an hour from Zion National Park). 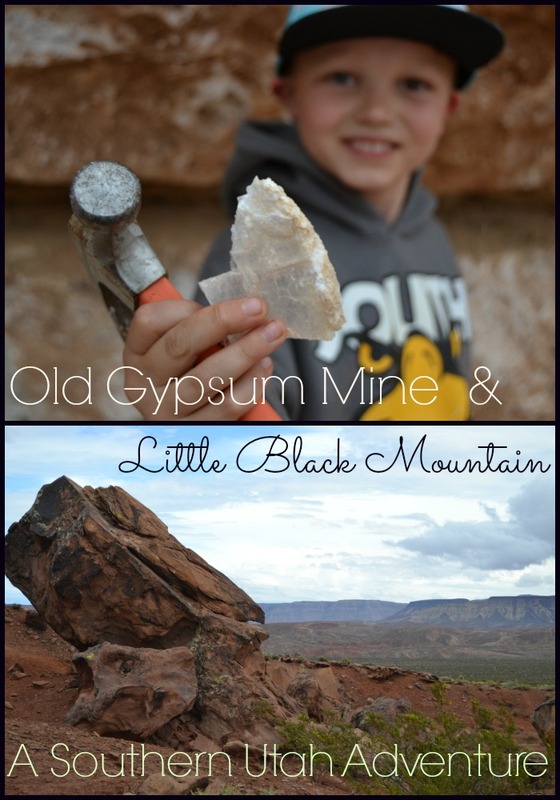 But today, we ventured out to a little-known place called the Old Gypsum Crystal Mine. It’s on the border of Utah and Arizona and it takes a little bit of traveling on dirt roads to get there. Everyone that goes brings buckets, hammers, and chisels and digs out treasures to bring home. The entire hole is super sparkly when it’s bright and sunny outside, but today was pretty gloomy so we didn’t get to see the shimmering glow. The kids and the adults all had a blast exploring the mine and it was nice for me, because it was a relatively safe place for the kids to explore. We did see a scorpion while were there, but we were in the middle of the desert, so that’s pretty much a given. Make sure you bring snacks and water, and there’s no bathroom, so make sure you go before you leave home! We also stopped at the Little Black Mountain Petroglyphs and enjoyed walking around and see the cool petroglyphs there. There is a toilet there, so that’s nice, but there’s no water so make sure you bring water. It gets pretty hot in Southern Utah in the summer, and you don’t want to leave home without water and snacks, especially if you’re hiking. The kids were exhausted by the time we got back in the car! It was a short hike, but all the kids were running back and forth and climbing the mountain. And the baby was an angel! I even discovered that she had cut her first tooth, while I was watching the kids explore! I love a good, free and fun adventure! What a fab fun adventure! I love crystal and rock hunting. I collect them too. It was really fun, the kids could have stayed all day!